√Sharp and Safe Blade:Excellent stainless steel blade with advanced manufacturing process,makes blade sharper and safer. √Rubber Handle:rubber coated handles for a comfortable grip and ensuring a safe nail trimming experience. √Instructions:Hold the paw of your pet.then press the end of the nail lightly to make the nail exposed;Cut the nail as the position in the picture. Pay attention to avoid the vessels and nerves. If cut the vessels accidentall,please use pet hemostatic drugs immediately to stop the bleeding. √High Quality: Stainless steel blade are guaranteed to be durable and last for years. 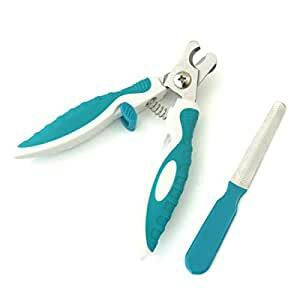 √Easy to use: our nail trimmer are small and lightweight so very easy to use. Grooming your dog effortlessly by yourself ! you want your dog to look sharp, but go to groomer cost a lot of money. So, here is your solution: choose PETCUTE pet shaver, no more expensive bills for pet grooming and you can do it in an easy way.